Protesters crowded into the Capitol rotunda for huge rallies in February and March 2011. Wisconsin Gov. Scott Walker says he has spoken with Vice President Mike Pence about how the new Trump administration could apply parts of Act 10 to federal employees. In 2011, Act 10 stripped public unions in Wisconsin, except for first-responders, of the power to bargain for anything except wage increases tied to inflation. Act 10 also instructed units of government to stop automatically deducting union dues from workers paychecks - workers must now personally pay their dues, and the act changed the rules for public union certification. The majority of workers belonging to a public union must now vote to re-certify it every year - not just the majority of union members voting. 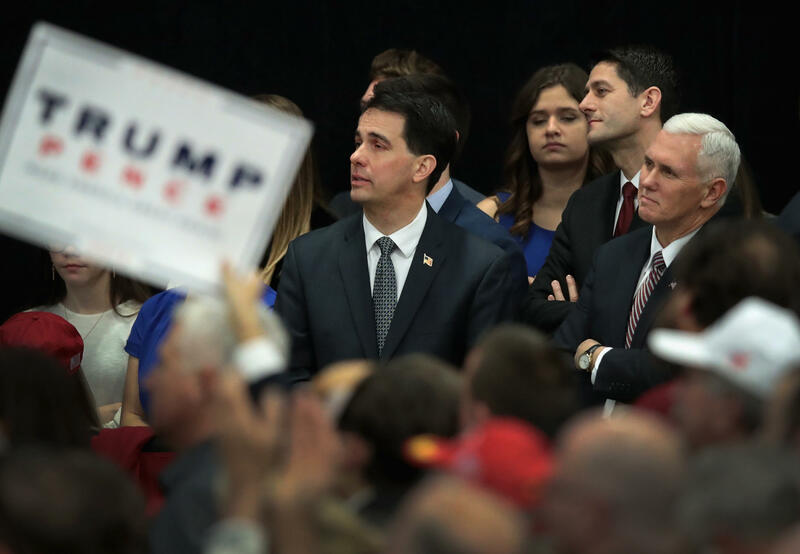 Wisconsin Governor Scott Walker (L) and Vice President-Elect Mike Pence (R) listen as then President-Elect Donald Trump speaks to supporters at a Thank You Tour 2016 rally on December 13, 2016 in West Allis, Wisconsin. Walker and the new Republican majority that swept into office during the November, 2010 elections enacted Act 10 a few months later - amid weeks of gigantic protests at the state Capitol by union supporters, and Senate Democrats fleeing to Illinois to foil a vote on the plan. GOP leaders eventually stripped-out the budgetary elements of Act 10, so approval required only a simple majority and no Democrat's approval. Courts have upheld the enactment of Act 10. Walker has insisted on its necessity for enabling state and local governments to get spending under control. The biggest population affected has been teachers. School districts now set the work rules for staff. Since Act 10 took effect in Wisconsin, union membership in the state has declined nearly 40 percent.